Glen David Gold was raised rich, briefly, in southern California at the end of the go-go 1960s. But his father's fortune disappears, his parents divorce, and Glen falls out of his well-curated life and into San Francisco at the epicenter of the Me Decade: the inimitable '70s. Gold grows up with his mother, among con men and get-rich schemes. Then, one afternoon when he's twelve, she moves to New York without telling him, leaving him to fend for himself. 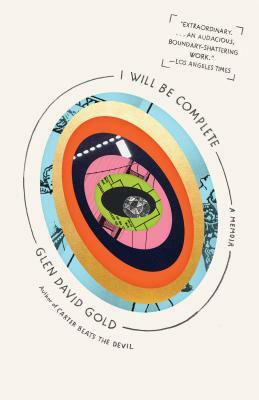 I Will Be Complete is the story of how Gold copes, honing a keen wit and learning how to fill in the emotional gaps: "I feel love and then it's like I'm driving on black ice with no contact against the road." He leads us though his early salvation at boarding school; his dream job at an independent bookstore in Los Angeles in 1983; a punk rock riot; a romance with a femme fatale to the soundtrack of R.E.M. ; and his attempts to forge a career as a writer. Along the way, Gold becomes increasingly fascinated with his father's self-described "cheerful amorality" and estranged from his mother, who lives with her soulmate, a man who threatens to kill her. Clear-eyed and heartbreaking, Gold's story ultimately speaks to everyone who has struggled with the complexity of parental bonds by searching for--and finding--autonomy.